I love being my kitchen. Some mornings I have plans to zip outside and do some gardening but I make the fatal error of thinking to myself that I’ll quickly whack on a loaf of bread – which I do. Then I think I’ll whip up a chocolate slice, or rather, “Dad’s” favourite slice – which I do. Then I decide to whiz up a shortcrust pastry – which I do, and 3 hours later I’m still there. Never mind – as I said I love being in my kitchen. Many of the things I do on these type of mornings result in items that I can freeze or pop into the fridge so I can be supremely organized for when I do need to use them. I don’t know about you, but I’m always happy to hear about other people’s hints and tips for best practices in the kitchen. If you have any, please add a comment in the reply section at the end of this post. I’d love to hear from you. Until then. Here are some of my best kitchen tips which I hope you might find useful too. Instead of water……. cook potatoes, rice, carrots etc in chicken, vegetable or beef stock for that extra special flavour. This is the time of year to start hoarding your garlic bulbs. Cut off the bottoms trying to keep the bulb whole. It’s not necessary to peel them (do so if you want to) but make sure the bulb is clean of dirt. Pack them tightly into an oven proof dish and cover them completely with a good quality olive oil. Put them on the stove top on a low to medium heat for about two hours – DO NOT BOIL – just keep them slowly simmering. Store the bulb and loose cloves in a jar and cover with some oil from the cooking process. 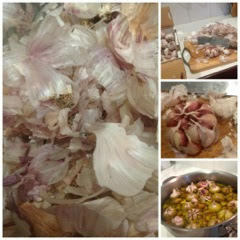 When you wish to use it you just need to squeeze the clove out and out pops the most delicious sweet garlic. Beautiful as a meat rub, sandwich butter, in dressings……….yummy. NB. The oil can be kept in the fridge to be used as a flavoured oil for about a week. Clean the inside of a kettle by boiling half a lemon in a kettle full of water an boil for about 5 mins. Rinse and repeat. Remember to take the lemon out as a cup of coffee or tea with water left over from this cleaning process is revolting!!!! Put a piece of paper towel in a bag with lettuce or spinach – helps the food keep for longer. When chopping up chillis wear rubber gloves. Label everything that goes into your freezer! Try not to become complacent. Have a felt pen and labels handy and make it easy for yourself. Tomatoes are best stored out of the fridge – guess you all know this but it’s worth mentioning again. Also put lemons (any citrus really) in the fridge in a ziplock bag if you want to keep them for longer than a week. This delays the drying out process. The other day, whilst making up one of the rooms here at Peppermint Lane Lodge, I was watching Everyday Gourmet with Justine Schofield. I do like her program and the way she makes things simple. She enlightened me with this storage trick: Put the food item in a ziplock bag and immerse it in water so the level is about the quantity of food item and slowly lower the rest into the water making sure you don’t get any water into the bag – and seal it shut. It almost creates a airtight vacuum – not quite – but worth doing. I really hope you’ve enjoyed reading about some of my kitchen tips and that you’ll find them useful at some stage. Over to you – got a great kitchen tip to pass on? Please let us know in the comments section below, we love hearing from you. Really useful tips , Kim. Thanks. Hope you can use some of them:) Surely even YOU have a tip or two to share with me:)?? ?